Comments Off on Bruins Get Revenge Over the Islanders! Bruins Get Revenge Over the Islanders! The Bruins defeated the Gananoque Islanders 6-4 tonight on the strength of Jackson Savery’s Hatty. He opened the scoring and closed the scoring with goals by Justin Bennett, Cameron Moffitt and Daniel Giorgio in between. Making his Bruins debut in goal was Jacob Gorden getting his first win of the season. Uxbridge is in Amherstview Sunday at 7:25 pm and back in Uxbridge next Friday Oct.5th to host the Georgina Ice. 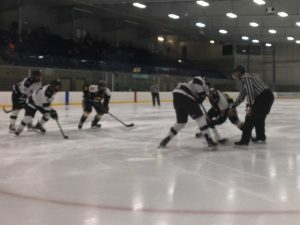 Uxbridge travelled to Napanee on Sunday evening to face the Raiders of the Tod division. A scoreless game until the 3rd period with over 100 minutes in penalties between the two teams. A hard hitting ‘old time’ hockey game with a playoff like atmosphere. Ryan McConkey kept them in it until the end stopping 28 of 30 shots, but the Raiders would come out on top winning 2-1. The Bruins look for redemption on Friday September 28th as they host the Ganonoque Islanders. Comments Off on Panthers No Match for the Bruins! Panthers No Match for the Bruins! Last year’s PJHL Tod division champs the Port Hope Panthers visited the Bear Den on Friday night. They were no match for the Bruins. The boys played a fast paced physical game laying the offence on thick. The Bruins won 10-0, outshooting the Panthers 50-15. Uxbridge travels to Napanee on Sunday. New this season, teams in the PJHL East conference will play an interlock schedule a part of their 42 game schedule. Where teams in the Orr and Tod division will face each other twice, home and home. 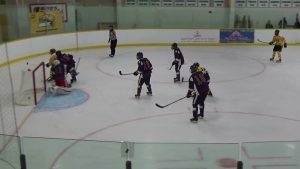 The Uxbridge Bruins travelled East Sunday to face the Ganonoque Islanders in the Tod division. Despite goaltender Ryan McConkey keeping them close, the Bruins fell short losing 2-1 and being outshot 35-31. Port Hope is in the Bear Den on Friday September 21st for the next Bruins game. Comments Off on Bruins win home opener! The boys took down last year’s Schmaltz Cup Champions the Lakefield Chiefs 3-2 on Friday night in the Bear Den! Special teams made the difference. The Bruins capitalized on 3 power play goals. Goals coming from Jackson Savery, Stefan Palatsidis, and Justin Bennett. Ryan McConkey stood tall stopping 27 of 29 shots. Uxbridge travels down the 401 Sunday to face the Ganonoque Islanders of the Tod Division. Comments Off on Former Bruins Behind the Bench! Former Bruins Behind the Bench! We are pleased to announce that Andrew Langlands has accepted the position of Head Coach of the Bruins. Andrew spent last year as an assistant with the Markham Royals of the OJHL and previous to that he was the Assistant Coach of our very own Bruins. Andrew’s knowledge of the game is extensive and he brings a calm and disciplined approach to our bench. 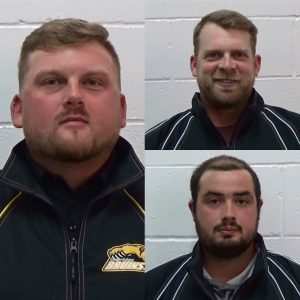 Joining Andrew on the bench this year we would like to welcome the following two assistant coaches to the Bear Den. Trevor Cox an Uxbridge Resident and pillar of the Uxbridge community rejoins the team he played 5 years for. Trevor saw success here as a player earning several division titles and a trip to the Schmaltz Cup in 2002. We also extend a warm Uxbridge welcome to former Captain of the Bruins Mike Spataro. Mike a Pickering resident also saw success as a player with the Bruins and his knowledge of the game has seen him coach at the AAA level. We are pleased to add both these gentleman to the fold. 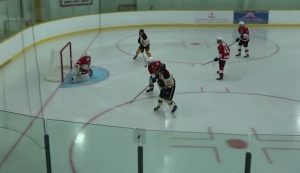 The Bruins closed out their PJHL Pre-season schedule last night at the Bear Den with a 12-0 over the Campbellford Rebels. Our organization would like to thank the Rebels for visiting us on very short notice, and we wish them the best of luck this season. Bruins face the 2017/18 Schmaltz Cup Champions, the Lakefield Chiefs, for their season opener Friday September 14th @ 7:45 pm in the Bear Den! Comments Off on Bruins beat Panthers! 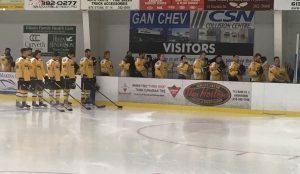 The boys traveled to Port Hope Tuesday night to face the 2017/18 Tod Division Champions in an exhibition game. 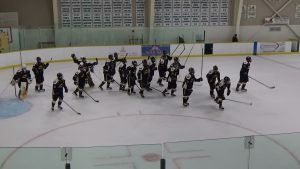 After a slow start the Bruins opened scoring in the second period and didn’t look back, winning 7-0 over the Panthers. Goals coming from Robert Freckelton, Noah Donaghy x2 (photo), Travis Buxcey (Video) x2, and Michael Rennie x2. 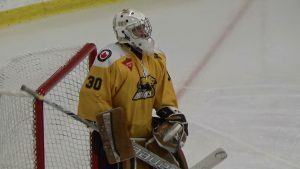 Ryan McConkey got the shutout for the Bruins in his first exhibition play this season. The Bruins outshot the Panthers 36 to 22. Comments Off on Bruins continue to look good in pre-season! Bruins continue to look good in pre-season! 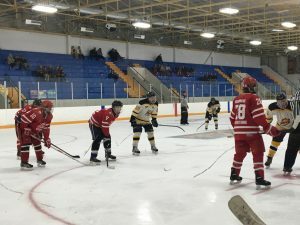 Bruins faced the Little Britain Merchants in their 4th exhibition game on Friday night in Stouffville. 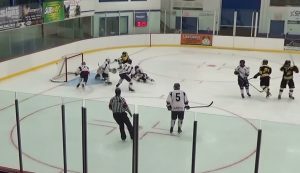 During the second period, returnee from the 16/17 season, Nick Sribny, took control of the puck from behind the Bruins net and went end to end eluding the defenders and finishing bar down. Other goals came from Daniel Giorgio, Justin Bennett, Thomas Sheedy, and Jackson Savery who netted the last 2. The boys outshot the Merchants 58-28 in the 6-0 victory. Sharing the shutout was 17 year old Leo Davidson, and Jake Gordon. The boys travel to Port Hope on Tuesday September 4th, and then its back in Uxbridge on Friday September 7th for the final exhibition.